Peak Energy: Biomimicry: Are Humans Smarter Than Sea Sponges ? Biomimicry: Are Humans Smarter Than Sea Sponges ? 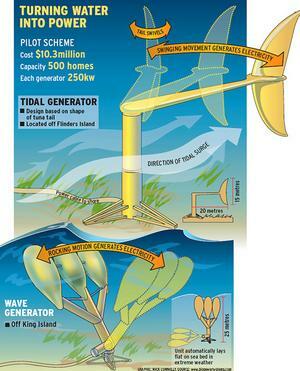 In my post on ocean energy a few months ago I briefly mentioned a scheme by a small Australian company called BioPower to trial some tidal power and wave power technologies in Bass Strait that used "biomimicry" based design principles. The project is due to go live next year, with 2 prototype units being deployed - the wave power system will be off King Island and the tidal power one off Flinders Island. Each unit can produce up to 250 kilowatts. The $10.3 million system is half funded by the Australian Government and the electricity generated will be used by Hydro Tasmania. BioPower CEO Tim Finnigan says the locations were chosen because Tasmania "offers a world-class wave climate on the west coast and a fantastic tidal environment on the eastern side". The field of biomimicry (also called "biomimetics" and "bionics") is a new one that has gathered an increasing amount of attention in recent years, with advocates promoting these types of designs as being efficient ways to harness natural resources and to use them in a sustainable way. In this post I'll look at the history of the science (apparently you can get a degree in it now) and at a range of examples where it is being applied. BioPower Systems' wave power device (Biowave) mimics the swaying motion of the sea plants found in the ocean floor. The system consists of three floating blades which are constantly oscillated by the motion of the sea, generating electricity as they do so. The flexibility of the blades enables them to deal with heavy seas without breaking, unlike more rigid designs. BioPower's tidal power system (Biostream) is based on the highly efficient propulsion of "Thunniform" swimming species, such as sharks, tuna, and mackerel. The device mimics the shape and motion characteristics of these species, as a fixed device in a moving stream of water. Due to the single point of rotation, this device can align with the flow in any direction. National Geographic has a video of the devices being tested. Biomimicry - "Innovation Inspired By Nature"
Biomimicry (from bios, meaning life, and mimesis, meaning to imitate) is a relatively new science that studies the designs nature has evolved through millions of years of trial and error and then imitates these to solve problems in a sustainable way. 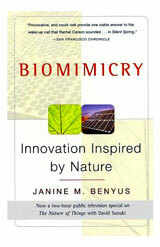 The term was introduced by science writer (and Club of Rome member) Janine Benyus in her 1997 book "Biomimicry: Innovation Inspired by Nature" (Buckminster Fuller was also a strong advocate of mimicking nature to achieve sustainable systems). The most frequently cited example of biomimicry is Velcro, which was inspired by the way burrs stick to fur - the scratchy side of Velcro acts like a burr, the soft side acts like fur. 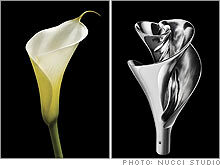 Biomimicry is not simply a slavish imitation of nature - instead nature is used as "Model, Measure, and Mentor". * Nature as Model means that we can get ideas from organisms to solve our problems. * Nature as Measure means we can observe nature to see what is possible. One commonly used example is spider silk, which is stronger than steel and tougher than kevlar, even though the spider "factory" is tiny and uses no boiling sulphuric acid or high-pressure extruders - and whose only material inputs are crickets and flies. * Nature as Mentor means we should change our relationship with nature, recognizing that we are part of it and that we should treat it as a partner rather than merely a mine to extract resources from. Biomimicry can be achieved on a number of different levels - the "form or function" level, the process level and the system level. * Biomimetic forms and functions are the most common - as per the Velcro example above. * Biomimetic processes are cases where the actual manufacturing of a product is done as nature would do it (which is frequently very dificult to achieve). * Biomimetic systems are closed-loop lifecycles, where outputs and by-products of one process become inputs for other processes (in "Cradle to Cradle" terminology it's where "waste equals food"). * A fourth level (not in Benyus' book) that has been suggested by Jeremy Faludi is the design level. This includes genetic algorithms and iterative design. Biomimicry on the design level can produce things that are biomimetic on the form/function, process, and system levels, but it can also produce things that nature has never evolved (such as an oddly shaped satellite antenna). The main obstacle to biomimicry in practice has been that nature builds things in a radically different way to human industry, which use "heat, beat, and treat" methods that physically manipulate materials to achieve the desired form, and often involves industrial chemistry which uses high temperatures and pressures that require large energy inputs. Instead, nature builds from DNA upwards, assembling a few molecules at a time into larger structures using organic chemistry. As our understanding of nanotechnology and biotechnology has evolved, it is now becoming possible to try and "grow" products rather than "build" them. The combination of environmental pollution and resource scarcity may help to encourage businesses to try and use chemical processes that follow nature's example - in water and at ambient temperature and pressure. * Janine Benyus shares her top 12 designs, from self-assembly to self-smoothing paint. * Robert Full (whose work with geckos is explored in the National Geographic story) shares his obsession with animal feet. * Sheila Patek looks at some extreme engineering from nature - the superefficient structures that allow shrimp to move at high speed. More recently Janine Benyus has established a pair of organisations (the Biomimicry Institue and the Biomimicry Guild) which aim to promote and commercialise the science. • "Don't foul your nest"
A Canadian company called Whale Power is designing wind turbines (and industrial fan blades) that imitate the form of humpback whale flippers - in particular the "tubercles" that line the leading edge of the fins. The tubercles dramatically improve the aerodynamic efficiency as they move through the water - with tests showing a 32 per cent lower drag and an 8 per cent improvement in lift compared to the smooth flippers found on other whales. The angle of attack of a flipper with tubercles could be up to 40 per cent steeper than a smooth flipper before stalling (ie. encountering a dramatic loss in lift and increase in drag) - and they stall gradually rather than abruptly. The company claims that turbines manufactured with this designs should be capable of capturing energy from weaker winds than usual, where conventional turbines tend to stall. This is expected to improve the business case for individual wind farms and to broaden the range of locations suitable for large-scale wind generation. Scientists are studying the way sea sponges get simple inorganic materials like silicon (extracted from the silicic acid in seawater) to assemble themselves into complex nano- and microstructures, in the hope that one day energy-intensive, capital-intensive semiconductor fabrication facilities used to create solar cells might be replaced by vats of reacting compounds. One approach being trialled uses zinc-oxide instead of silicon to produce primitive solar cells. One frequently used example of biomimicry is the Eastgate Centre in Harare, Zimbabwe. This green building has no conventional air-conditioning or heating, yet stays at a comfortable temperature by imitating the structure of the self-cooling mounds created by termites (some observers don't like the people who inhabit buildings being compared to termites, but I still think this is a useful design innovation). 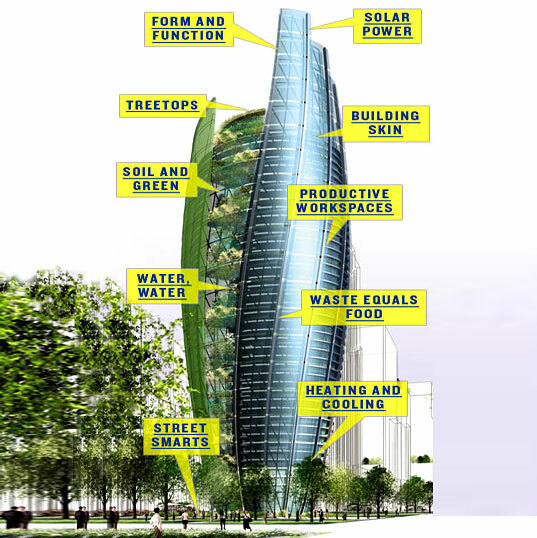 William McDonough's firm is also looking at high rise buildings inspired by nature - in their case by trees - giving rise to the term "treescraper". Another biomimicry based development is in the Canary Islands, with a desalination plant using design techniques inspired by Namibian Fog Basking Beetles and the nostrils of camels to capture water. The architects hope this will show the islands how they can "move towards self-sufficiency in water and energy, without relying on fossil fuels". 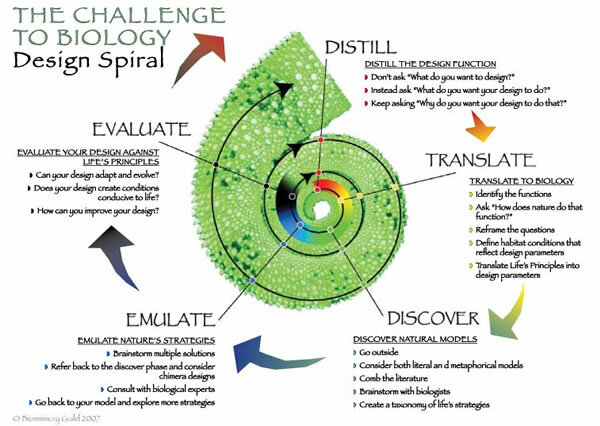 One shape which appears regularly in the biomimicry world is that of the spiral. A company which is concentrating on the use of spirals in advanced designs is PAX Scientific (yet another recipient of investment funds from Vinod Khosla), which is designing energy efficient fans, impellers and pumps based on observation of the way fluids flow. The company was started by a naturalist from the Australian Department of Fisheries and Wildlife named Jay Harman (one of a number of local practitioners of biomimicry). Harman noticed that the spiral pattern occurs repeatedly in nature when water or air is in motion - in eddies in streams, in waves, in smoke plumes as well as in the shape of Nautilus shells - and was inspired to come up with energy efficient devices based on what he calls the "streamlining principle". For example, Pax's impellers are claimed to be able to circulate 4 million gallons of water through industrial storage tanks while drawing no more electricity than a couple of 100-watt lightbulbs and their fans (being developed by a company named PAX Fan which includes Paul Hawken, of "Natural Capitalism" fame) are expected to use half the energy required by conventional designs. Another spiral based design I've noticed recently was this Austrian "Gravitational vortex hydro-power plant". These designs remind be of an Austrian scientist (if that is the right description for him) named Viktor Schauberger, who is almost deified in some fringe subcultures and was colloquially known as "The Water Wizard". There is a lot of strange history behind this guy (extending back to Keppler and Pythagoras) which I've never investigated properly, but he does seem to have been quite influential, one way or the other. I mentioned Paul Hawken above - he is also involved in another Australian biomimicry company called BioSignal, which is trying to commercialise seaweed based anti-bacterial treatments. The company produces synthetic compounds which imitate a seaweed whose "furanones" disable bacteria's ability to colonise surfaces, with the aim of keeping surfaces clear of bacteria buildup in industrial and hospital environments. * "Viral batteries", which imitate the way red abalone grow their shells to build tiny rechargeable batteries using virus'. * Sewage treatment systems that use live plants and microbes which are selected and arranged to imitate a natural ecosystem. * Fuel efficient cars with very low drag coefficients inspired by the shape of the box fish. * Self healing aircraft made of composite materials that "bleed" resin "when stressed or damaged, effectively creating a "scab" that fixes the damage". * Nanotube based adhesives that mimic gecko feet. * Shark inspired textures for Speedo swimsuits that mimic the denticles, reducing drag in the water. * Self cleaning coatings for cars and building surfaces based on the Lotus leaf. * Photonic crystals for use in optical computing based on the shells of beetles. * Adaptable polymers that switch between flexible and rigid states, inspired by sea cucumbers. * DARPA is building cyborg insects for use in surveillance applications. * Solar lily pads proposed for Glasgow's Clyde river (admittedly these seem to be more of artistic value than a cost effective way of generating power). Hopefully you've found some of these ideas interesting. I'll close with 2 final links - one to a series of articles on "Constructal Theory" - the "inverse of biomimicry", and another to an Edge interview with Kevin Kelly on "The Technium And The Seventh Kingdom Of Life" which mentions his "all species inventory", amongst other things. In nature efficiency is honed to a fine edge by natural selection and perhaps other means. 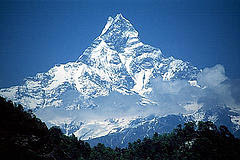 We, of course, would do well to observe the living things and learn from them. There is no doubt a sponge is not as "smart" as a human in human terms, just as a human is not as "smart" as a sponge in sponge terms. Actually the sub-title is just a little jibe at a phrase commonly heard in the peak oil world - "Are humans smarter than yeast".